While potholes can occur at any time of the year, they are most prevalent in Rhode Island during late winter and early spring. Pothole patching happens several days a week, but cannot be done during winter storms. During weeks with more than one storm, or during long-duration storms, it may take longer for us to complete pothole repairs. Once we learn about a pothole on a state road, we log it into our system and dispatch crews to fill it as quickly as possible. 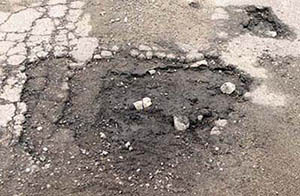 There are several different techniques that can be used depending on the location of the pothole, its size, the materials available, and the time of the year. Asphalt products are typically applied during warm weather, so it can cure properly and make a durable driving surface. In the winter months, the same asphalt mixes we use during the rest of the year are not available. The material available to us in winter is called cold patch - so named because it remains workable even in the coldest temperatures. Even if it were available, hot asphalt would cure and harden before we could apply it. Aside from the materials used, consideration also must be given to where a pothole is. If we're patching on the highway, the impact of our repair operations on traffic must be taken into account - as well as the safety of our workers. In these instances, we move swiftly to lay material and get off the road - especially in times of heavy traffic. We may return to the same location for more work when traffic is lighter. As part of our effort to make these repairs more efficient and cost effective, we employ a device called a hot box. These units attach to our trucks, and heat and insulate cold patch, making it more effective. We also use equipment such as rollers and plate compactors that help us achieve a more durable patch. The deteriorated condition of our roads in Rhode Island results in more potholes, especially on secondary roads. Currently 40 percent of state roads are rated fair or worse. Through our Pavement Preservation Program, we work aggressively to address roadways before they become so poor that they need a costly fix. A large gap exists, however, between what can be accomplished at current funding levels and the monies needed to address our system as a whole. Click on the link above to report a pothole on a State road, or call us at 401-222-2450 weekdays from 8:30 a.m. to 4 p.m. If you spot a pothole outside these hours, please call 401-222-2378. Potholes begin after snow or rain seeps into the soil below the road surface. The moisture freezes when temperatures drop, causing the ground to expand and push the pavement up. As the temperatures rise, the ground returns to normal level but the pavement often remains raised. This creates a gap between the pavement and the ground below it. When vehicles drive over this cavity, the pavement surface cracks and falls into the hollow space leading to the birth of another pothole.